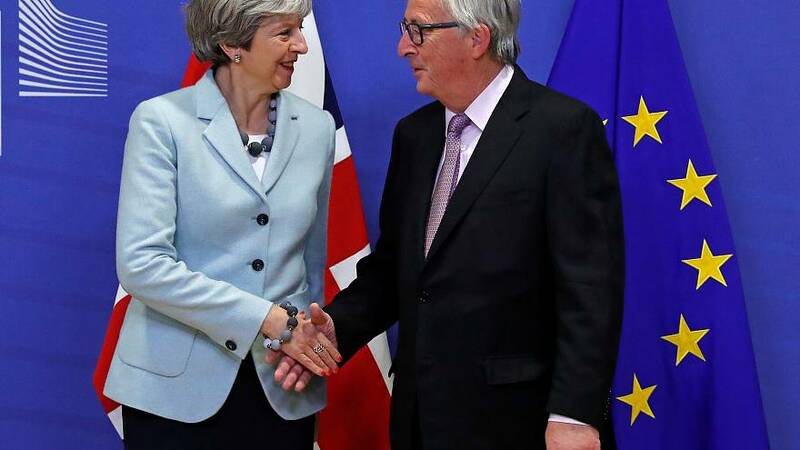 The EU and the UK have agreed to a "breakthrough" deal on Friday (Dec 8) that paves the way for the second round of talks involving trade negotiations. The dramatic announcement means that a consensus has finally been reached on Brexit's three outstanding issues: citizens' rights, the so-called divorce bill, and the Irish border. The EU and the UK have published a joint report on the deal. So what exactly has been agreed? The report is a compromise designed to address concerns of the UK government's Unionist partners and also those of the Dublin government concerning the Republic's economic integration with Northern Ireland, peace and stability. It says the 1998 Good Friday Agreement—which secured peace after three decades of sectarian violence - "must be protected in all its parts". That agreement assumed the EU membership of both the Irish Republic and Northern Ireland, but the North's future departure from the EU as part of the UK has cast doubt over the future application of the Agreement. There is a guarantee that there will be "no hard border" between Northern Ireland and the Irish Republic. "The United Kingdom remains committed to protecting North-South cooperation and to its guarantee of avoiding a hard border," the joint statement says. The UK reaffirms its commitment to avoiding "any physical infrastructure or related checks and controls". The Irish government had recently threatened to veto talks moving on to the next phase unless the British government included a written guarantee. The document now makes it clear that the commitments and principles outlined "must be upheld in all circumstances", adding that the UK "remains committed to protecting North-South cooperation and to its guarantee of avoiding a hard border". Even if there is no future EU-UK agreement, the document seeks to ease fears of an economic rupture between north and south. "The UK "will propose specific solutions to address the unique circumstances of the island of Ireland... The United Kingdom will maintain full alignment with those rules of the Internal Market and the Customs Union, which now or in future, support North-South cooperation, the all-island economy and the protection of the 1998 Agreement", it says. The report underlines that for the UK, Northern Ireland remains "an integral part of the United Kingdom, consistent with the principle of consent". Unionists have been alarmed that compromise could see a weakening of Northern Ireland's ties to the rest of the UK in order to align its economy with the Republic's. Further assurances to Unionists are given, with the UK committing itself to "preserving the integrity of its internal market and Northern Ireland's place within it", when the UK leaves the EU's Internal Market and Customs Union. Whether or not the UK and the EU reach a deal on future relationships, the UK commits itself to "no new regulatory barriers" between Northern Ireland and the rest of the UK , and to "unfettered access" for businesses in the province to the rest of the UK. The joint text from the EU and the UK says the overall objective is to protect the rights of both EU and UK citizens. The rights of EU citizens in the UK remain essentially unchanged, although there are tighter limits on the rights of EU nationals to bring family members to live with them in Britain. Rights of children and those of partners in existing "durable relationships" are guaranteed. The EU has compromised over the role of the European Court of Justice (ECJ). Brussels had demanded that the EU court have the ultimate say in whether a future agreement was being upheld. The agreed position now is that EU case law will be used to interpret the deal on citizens' rights. UK courts will be able to decide whether to refer cases to the ECJ for a period of eight years after the deal comes into force. Procedures for EU citizens applying for residence status in the UK and vice versa will be "transparent, smooth and streamlined", the document says, avoiding any "unnecessary administrative burdens". Existing rules on social security and healthcare should continue to apply. Free movement continues up to a specified date, which is set as the time of the UK's withdrawal from the EU. The UK agrees to pay into the EU budget for 2019 and 2020 "as if it had remained in the Union". It will also "contribute its share of the financing" of EU liabilities incurred before 31 December 2020 that become due in the future. No figure is given for the UK's settlement of its EU membership obligations, though estimates vary between 40 billion and 60 billion euros. Principles are set out for an agreed methodology to calculate the bill. There are assurances that the UK will receive a share of benefits it would have had if it had remained a member. Its contributions will be calculated according to existing arrangements. The UK's financial settlement will be drawn up and paid in euros. Other financial arrangements will see the gradual reimbursement to the UK of its paid-in capital to the European Investment Bank. The UK agrees to honour commitments made before withdrawal such as for taking part in a refugee programme in Turkey and a migration programme in Africa. The EU's Brexit negotiator Michel Barnier said the EU had agreed to drop its demand for the UK to meet the cost of relocating UK-based EU agencies. The two sides agree to cooperate further on nuclear regulation, given the UK's future withdrawal from Euratom, and police and security matters. They also recognise the need for certainty over goods placed on the market under EU law before withdrawal, to minimise disruption for business and consumers.